Bring Your Yoga to Work! Awareness: Mindfulness, and our yoga practice, stands on the foundation of awareness. We must be aware in order to be in choice. The same goes for work. We must truly be aware of how we are showing up in each situation in order to empower ourselves to make a different choice. Each time there’s something challenging, do you react with impatience and frustration and start to snap? Do you double down on your focus and forget about other people having an experience of that challenge? Noticing gives us options. Non-judgment: Okay, okay WE hears this one all the time—but you HAVE to judge when you’re at work. Maybe… but try this on: you need to evaluate what is and continue moving forward with better and more information. Calling it good or bad may be optional. And calling a person good or bad is definitely optional. Watch what happens when you can slow the roll on judgment and stand squarely in the mutual purpose of having a successful outcome. Vulnerability: The dreaded V word at work. And yet, as Brene Brown reminds us, this is the birthplace of creativity and innovation. Sometimes we have to say “I don’t know.” Sometimes we need to be wrong in order to get to our desired outcome. And sometimes we need to show we are human in order to truly lead other humans. This is a great place to experiment and play with showing up as more and more of your whole self. Yes even at work! 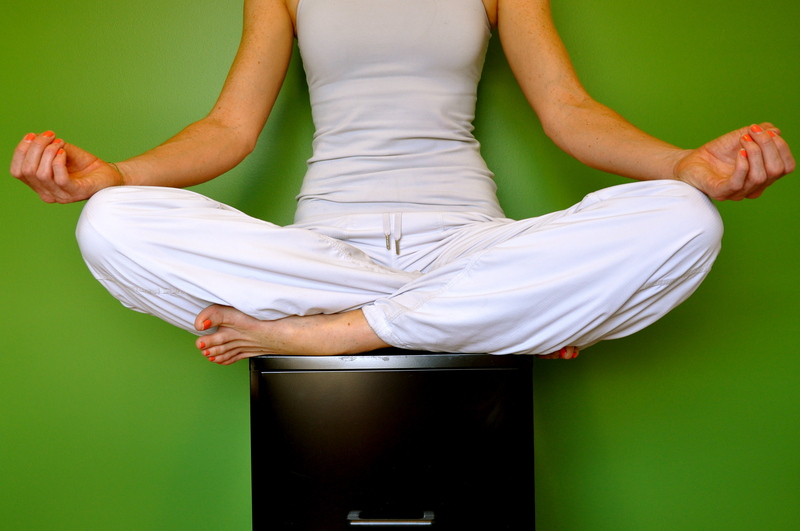 So how do you remember to use your yoga at work? It’s a practice just like anything else. And the more you can bring moments of your “regular” yoga to work, the more you’ll remember to keep it alive in between. That’s why WE created online office yoga breaks through YogaDownload. These breaks range from 5-15 minutes and address a multitude of work challenges. If you want a discount for a YogaDownload membership, click here to get a year unlimited membershp for $29. And even better, talk to us about bringing an in-person yoga class to your workplace. We currently offer classes in Denver and Los Angeles, and we’re eager to help you share your yoga with your co-workers! Contact us here.